Arguments concluded today in the court of appeal in the nationalization of B.T.L. and B.E.L. British Barrister Nigel Pleming representing the British Caribbean Bank’s arguments focused on why the 2011 nationalization act was invalid since it seeks to revive the 2009 nationalization act which was declared null and void by the court. On the government side, senior counsel Denys Barrow replied to submissions made earlier by Queens Counsel Peter Goldsmith and Senior Counsel Eamon Courtenay who is also appearing on behalf of Fortis, the previous owner of B.E.L. After three days of hearings, the Court of Appeal will not deliver judgment as the presence of Justice Awich on the panel will be challenged at the Caribbean Court of Justice. 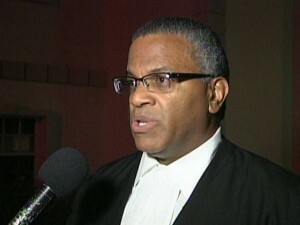 After six o’clock this evening, News Five spoke to Courtenay as they exited the courtroom.